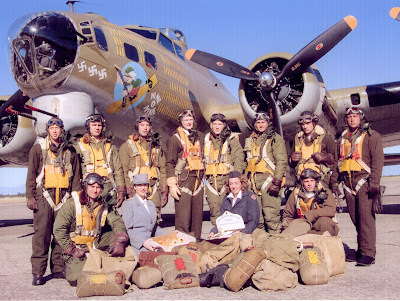 A crew posing with full equipment in WWII. Note the parachute packs in foreground. Airmen flew in extreme weather conditions. At 20,000 feet, the air could be fifty below zero, and nearly devoid of life-giving oxygen. 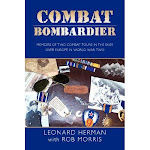 Both the B-17 and the B-24 were unheated and unpressurized. The photos below were taken at the 390th BG Museum at the Pima Air Museum in Tucson. 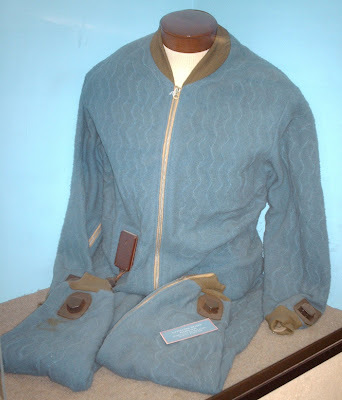 Exhibit at the 390th Museum at Pima Air Museum, Tucson, shows the full flight kit of a bomber crewman. Flying in temperatures down to fifty below zero at altitudes nearly devoid of oxygen, the kit includes, top to bottom, leather flight helmet with built-in headphones, flight goggles, throat mike, oxygen mask, shearling leather flight jacket, Mae West yellow life jacket, parachute harness, shearling leather flight pants, shearling leather gunner gloves, and shearling boots. The parachute is at the feet of the airman. 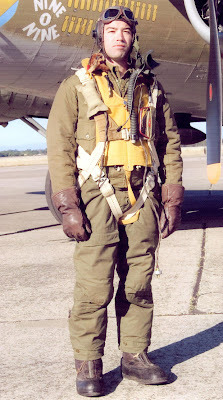 A vintage shot of a crewman with much of the same gear, though he is wearing clothing for slightly warmer conditions. This electrically-heated 'bunny suit' was used by early air crews. Plugged in to the aircraft's power supply, the suit had a tendency to overheat or short out, causing burns, and many stopped using them because of this. 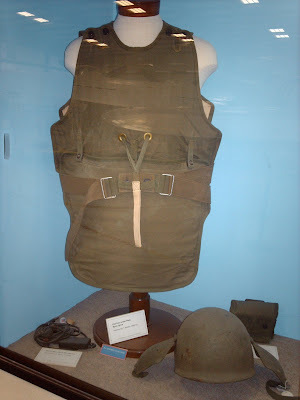 This flak jacket and helmet protected airmen from the dangers of jagged, red hots shards of flak. My husband was restoring a B-17E. His company was working one the wings. The owner decided to pull the project. It made us sad that it was never finished. Maybe someday. He's working on a P-38 at this time.